RALEIGH, N.C. -- North Carolina Republicans stripped the incoming Democratic governor of some of his authority on Friday and were on the cusp of an even greater power grab, an extraordinary move critics said flies in the face of voters. Just last week, it appeared Republicans were ready to finally accept Democrats’ narrow win in a contentious governor’s race. As it turns out, they weren’t done fighting. In a surprise special session in the dying days of the old administration, some say the Republican-dominated legislature has thrown the government into total disarray, approving at least one bill aimed at emasculating incoming Gov. Roy Cooper’s administration. Cooper, the current attorney general, has threatened to sue. And many in the state are accusing Republicans of letting sour grapes over losing the governor’s mansion turn into a legislative coup. 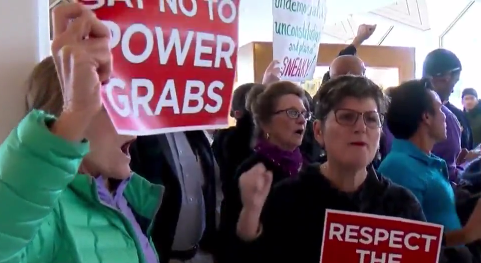 The protesters were so loud that Senate and House cleared the galleries - a highly unusual move - and more than two dozen people were arrested this week. Some protesters chanted “all political power comes from the people” as demonstrators were escorted from the Legislative Building by authorities. Those that remained behind could only watch the debate through glass windows or listen to it online. “The kindergartners are getting rowdy,” said Republican Rep. Dana Bumgardner. Another bill that received final legislative approval would force Cooper’s Cabinet choices to be subject to Senate confirmation. McCrory must decide whether to sign the second law passed by a General Assembly that has repeatedly tugged the man who campaigned as a moderate in 2012 as Charlotte’s moderate former mayor into hard-right turf. Lawmakers’ veto-proof majorities since 2013 and the uncompetitive election districts they drew have allowed legislative Republicans to ignore Democratic viewpoints and sometimes McCrory’s desires. “There’s probably no better time than to deal with it in the present,” said Republican Rep. Bert Jones. “I really fear that we have harmed our reputation and integrity this week,” said Rep. Billy Richardson, a Democrat. Cooper ran on a platform of defeating Republicans’ agenda, saying he would work to repeal a law known as House Bill 2 that limits LGBT rights. “If I believe that laws passed by the legislature hurt working families and are unconstitutional, they will see me in court,” Cooper said. Republicans pointed to past sessions of the General Assembly, when it was dominated by Democrats. Democrats stripped the powers of the first and only GOP lieutenant governor of the 20th Century in the late 1980s. But Democrats said there’s been no such widespread effort to limit the power of an incoming executive before he took office. On Friday afternoon, N.C. GOP Chairman Robin Hayes issued a statement about those protesting the dicusssions this week. “Yesterday the rights of over nine million citizens were violated when a small mob formed inside the North Carolina House and Senate Chambers in an attempt to stop the duly elected representatives from debating critical issues,” the statement said, CBS Raleigh affiliate WNCN reported. “We support the freedom and right of every citizen to speak for or against legislation, and well as the constitutional right to petition government for a redress of grievances. However, when a few hundred people decide to shut down the work of the General Assembly simply because they are against the outcome, we have gone from free speech to mob rule,” it said.